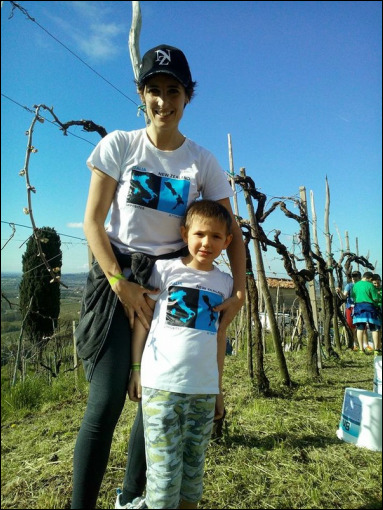 ​Here is Rosalba and her boy Angelo wearing the Opposites Attract t-shirt while on a trek in the vine groves of Valdobbiadene, Italy. Rosalba and her husband Ivano along with her children Lina and Angelo lived in New Zealand for a few years before returning to Italy. These are Francesca and Beatrice, my twin second cousins from Pordenone near Venice. I sent the tshirts as a gift for their First Holy Communion. This is Kate Capie wearing her tshirt while walking along the Tiber River in Rome. Cousins Marco and Luca Bomboi from Sardegna. Here is Casper Ray wearing one of my t-shirts. Casper lives in Luxembourg. His mum, Julia and Dad, Paul are from New Zealand. We get to see Casper when he visits his grandparents who are our neighbours. Looks like Casper is enjoying wearing his t-shirt! He makes a great model! Marco Bomboi wearing one of my t-shirts in Siniscola, Sardegna. Marco is my second cousin. Marco came to New Zealand as a AFS student and studied in Ranfurly for 6 months when he was a secondary school student. He is now a plastic surgeon living in Verona but commutes regularly back home to Siniscola. Gino Cuccurullo, my brother. On left having a paddle in Lago di Garda and on the right, outside the Colloseo, Roma. Gino was in Italy on a business trip for the Mediterranean Food Warehouse though it looks as if he had time for some fun too! Here is Dr Adalgisa Giorgio, Senior Lecturer in Italian Studies, from Bath University in the UK. The photo shows Adalgisa presenting some preliminary results at the Society for Italian Studies Biennial Conference, held in July 2013 at the University of Durham. Adalgisa was in New Zealand where she carried out over 160 hour-long interviews with Italians and Maori-Italians in Auckland, Wellington, Porangahau-Hastings and Turangi. 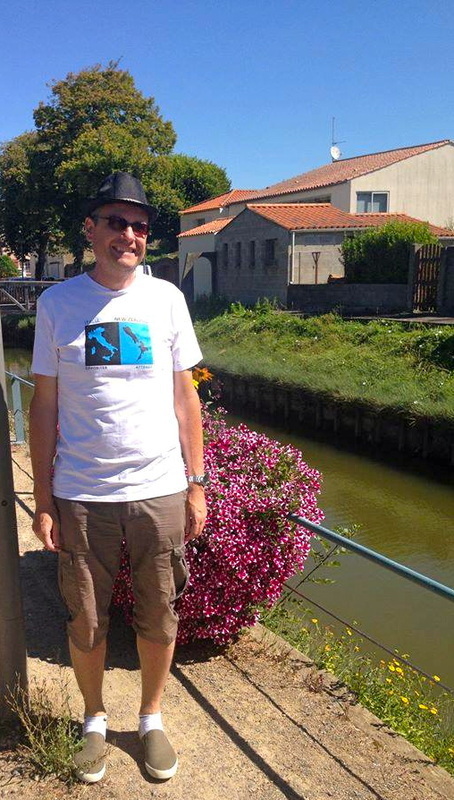 Monsignor Mark Crisp from England wearing it on holiday in the Lore Valley, France. Mark is the brother of my good neighbour Angela who along with her husband Joris gave Mark the t-shirt as a gift. Here is my second cousin Laura Bomboi from Sardinia in Italy along with her boyfriend Agostino. Laura came to visit us along with her mother Gaetanina. They live in Sinsicola, Sardinia, Italy.